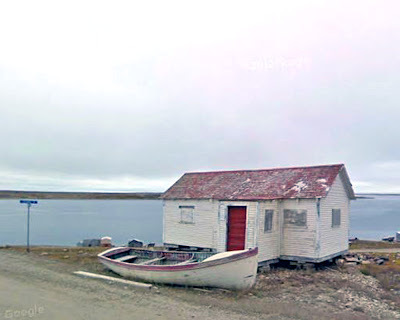 Google Maps continues to make the world accessible to everyone as Street View expands to the Canada's far north. Cambridge Bay house and boat in an isolated Nunavut hamlet from Google Maps Street View, shown above. I tried to find Rankin Inlet because I have a friend that lives up there (big shout out to Goretti Kakuktinniq) but they haven't brought Street View there yet. "You can explore this tiny hamlet for yourself, and better understand what it's like to live up in the north. Walk down Omingmak Street, or make your way the bridge (where locals fish for Arctic Char), and out to the Old Stone Church. See some Arctic souvenirs in the Arctic Closet, or visit the Ice Hockey and Curling Arena (which isn't insulated and freezes over once they flood it in the winter!) Learn about Inuit culture and the far north at the Kitimeot Heritage Society or the Arctic Coast Visitors Centre. There is so much to explore, and now that winter is coming, you can do it all from the comfort (and warmth) of your armchair. You can explore this tiny hamlet for yourself, and better understand what it's like to live up in the north. Walk down Omingmak Street, or make your way the bridge (where locals fish for Arctic Char), and out to the Old Stone Church. See some Arctic souvenirs in the Arctic Closet, or visit the Ice Hockey and Curling Arena (which isn't insulated and freezes over once they flood it in the winter!) Learn about Inuit culture and the far north at the Kitimeot Heritage Society or the Arctic Coast Visitors Centre. There is so much to explore, and now that winter is coming, you can do it all from the comfort (and warmth) of your armchair."